My now regular route from Clydeside to Dumfries takes me by motorway to within twenty miles of my destination, the University of Glasgow’s School of Interdisciplinary Studies, where I am a PhD student, linked with the End of Life Studies Group. I am researching how writers depict physician-assisted death, and suicide. Today I was pleased to be travelling at a slower pace to Thornhill, a trig wee town at the south end of the breathtaking Dalveen Pass. It’s a splendid, winding road; quiet and deep in the hills, with sky and moorland and the chance to see some wildlife. The red kite was flying just above and ahead of me. My previous experience of these impressive raptors has been seeing dozens of them in an acrobatic feeding frenzy at Bellymack Farm; a part of the local ‘kite trail’. But here was a single graceful creature, wheeling and soaring over the valley, with scarcely a wingbeat. I was close enough to see the striking chestnut/black/white plumage and to wonder at the precision rudder of its hallmark forked tail. Kites feed themselves and their young on small mammals, but also on carrion, creatures already dead. As I watched it scanning the landscape and me, it seemed that the bird and I had a common interest. This evening, we were each invested in death as part of the cycle of life. The kite was foraging for a meal. I was on the way to my first Death Café. Good tea and coffee and quality cakes seem to be crucial elements of the experience, and we were well served by the staff at Thomas Tosh. We gathered in small groups in a bright and arty space. Of the four women at our table, I was the novice; the others had attended similar events before. We spanned a range of ages and nationalities: Japanese, Norwegian and Scottish. Our professional backgrounds included philosophy, social science, the arts world, the media, literature and healthcare. 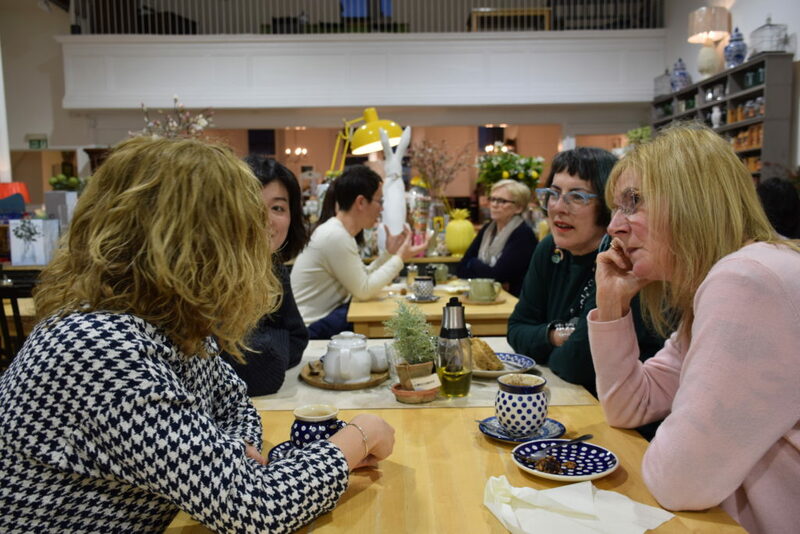 I understand that the theory and the ethos of the Death Café movement is to support conversation about dying, death and bereavement, but I was interested to find out what would happen and how the ground rules would work. We were advised that there would be no formal presentation, agenda or conclusion, just the opportunity to talk and to listen for ninety minutes. When we introduced ourselves, as always, the topic of my PhD was an immediate catalyst for discussion. Even among those who are comfortable talking about death, the idea of chosen death can be challenging. One of our group raised the concern of the frail elderly being pressured to make decisions about the end of life because they feel they are becoming a burden. The counter argument is that the idea of ‘burden’ is a social construct that can be managed by better support, reassuring the elders that they still have a valuable contribution to make to society. Suicide is always an emotive subject. One contributor lives in a small town, where the recent sudden death by suicide of a young man had affected not only his immediate family and friends, but the whole community. We discussed the grief, stigma, guilt and blame that can follow such a sad event, but there was also a sense that in this instance the people were drawn closer together because of this death. Our talk turned to the rituals that accompany dying and death. We discovered that ‘witnessing’, being with, or accompanying the dying person, is a tradition in several cultures. We agreed that it is a privilege to be present at the peaceful death of a loved one. But there is also a practice of remaining with the dead, guarding, offering prayers, celebrating the life that has ended. This is a familiar rite in Roman Catholic tradition and in Judaism, where Shemira is the practice of being present with the body. Similarly, we learned that the custom is observed in Japan, where even young children are encouraged to spend time with their dead family members. It is important that young people develop a healthy attitude to death in a supportive environment, and this seemed to be a positive practice. We discussed what a valuable resource ritual can be for the bereaved in our increasingly secular society and we shared moving personal stories of death and its aftermath. There were tears at our table, but also smiles and laughter. We recounted tales of travelling with the loved-one’s ashes (best to carry the paperwork too) and of the challenges of organising a part-religious and part-humanist funeral (don’t be daunted when told, ‘you can’t’). The evening passed quickly and lightly and ended with a feeling that there was still much more to share. I would like to know how the other conversations had gone and how the mix of participants at each table had guided the discussion. But this is Death Café and the only record is in the memory of those who took part. No two will ever be the same. I’m looking forward to the next one.